Rodgers was chosen by the Packers in the first round of the 2005 NFL draft (24th overall) and backed up veteran QB Brett Favre for three seasons before inheriting the starting job. He performed well in the unenviable role of following a legendary performer in 2008, throwing for 4038 yards and 28 touchdowns against 13 interceptions. In ’09 he showed improvement, tying for the league lead in lowest interception percentage (1.3) while passing for 4434 yards and 30 TDs and showing impressive mobility as he rushed for 316 yards. 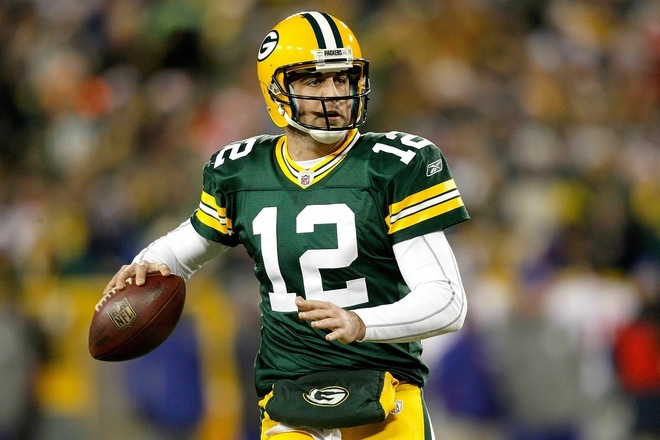 The Packers reached the postseason and Rodgers was selected to the Pro Bowl. In 2010, the Packers started off slowly and Rodgers sustained two concussions, but he and the team played well down the stretch, qualified for a Wild Card playoff spot, and achieved a NFL Championship with a win over the Steelers in the Super Bowl. Packers went 15-1 to finish first in the NFC North with the conference’s best record while leading the NFL in scoring (560 points) and touchdowns (70). Lost NFC Divisional playoff to New York Giants (37-20). Rodgers had another Pro Bowl season in 2012, leading the league in passing for the second straight year (108.0 rating) while throwing for 4295 yards and 39 touchdowns against just 8 interceptions. Through eight seasons (five as a full-time starting quarterback), Rodgers has a passer rating of 104.9 – the highest for a NFL player with at least 1500 pass attempts - and has been selected to the Pro Bowl three times.